The Kollel Rebbeim and Staff wish everyone a Chag Kasher Vesameach! ​There is plenty of street parking on local streets. 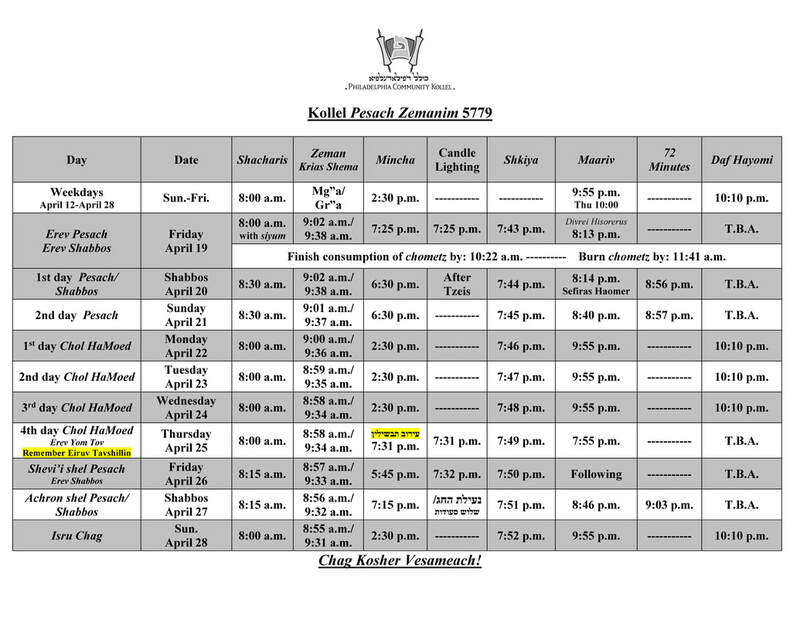 The Kollel Bein Hazmanim Intersession- runs from Friday April 12 through Sunday, May 5 (1st day Rosh Chodesh Iyar). With the exception of Daf Yomi and Kollel Boker, all chavrusos and shiurim will not be in session. Shacharis : 8:00 a.m. Mincha: 2:30 p.m.
Pesach Shiurim Audio Page: To hear lectures and advanced shiurim from previous years, please see our YBH Pesach Audio page. To see a complete schedule of shiurim, click on graphic below. MAOS CHITIM! As in the past, the Kollel will be accepting donations for Maos Chitim to be distributed through the Kollel. Donate online (write "Maos Chittim" in the description box) or with a check payable to the Philadelphia Community Kollel (write "Maos Chittim" in the subject line) or Contact Rabbi Zeffren at 610-507-3906 or yoelz@verizon.net. May your generosity in helping these needy families be a zechus for you and yours to thoroughly enjoy Pesach with joy and good health!